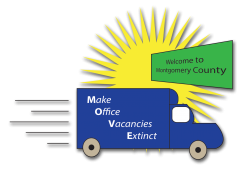 The City of Rockville has joined Montgomery County in fighting the growing office vacancy issue in the County by launching a MOVE Program, short for Make Office Vacancies Extinct. The Rockville MOVE Program is open to businesses that are relocating or expanding from outside Montgomery County, or startups moving into their first commercial space. The Program is designed to reduce vacant Class A and B space by providing grants up to $4.00 per square foot for office, industrial, and flex space that is leased or purchased. The program is a supplement to the Montgomery County MOVE Program, which offers up to $8.00 per square foot, not to exceed 10,000 square feet. Businesses may receive funding through both programs for a total of $12.00 per square foot and those that do not receive assistance through the County may still qualify for the City’s program. To qualify for the Montgomery County MOVE Program, applicants must operate primarily in the information-technology, life science, cyber-security or green technology industries, whereas the Rockville MOVE Program is open to any industry sector, except retail and restaurants. Rockville’s Program requires that the applicant purchase a property or execute a lease with a landlord for at least three years in a Class A or B office, industrial, or flex space in the City and that the space must between 1,000 and 10,000 square feet. Montgomery County’s Program requires that the applicant sign a commercial lease with a landlord for at least three years in a Class A or Class B commercial office building in the County and that the space must be between 2,000 and 10,000 square feet. L-Soft International Inc., an e-Marketing firm, was the first company to utilize Montgomery County’s MOVE Program. L-Soft relocated from Landover in Prince George’s County to Bethesda and signed a lease for about 4,900 square feet, which made it eligible for a $20,000 grant from the County back when the Program only offered up to $4.00 per square foot. Other companies that have used the County’s MOVE Program include Vtsee Inc., a life sciences firm which leased almost 3,900 square feet in Gaithersburg; Barr Group, a firmware company which leased roughly 3,400 square feet in Germantown; and Advagenix, a genetics firm that signed on for nearly 2,300 square feet in Rockville.